Cass and a reluctant Brad try to solve the mystery of The Old Wicklow House, rumored to be haunted, during the Blizzard of 1966 in Southern Maryland. This time, she pulls from her arsenal as protection against restless spirits the powerful protection of crystals: moonstone, pyrite, Blue John, snakestone, carnelian, amethyst, and bloodstone to mention a few. 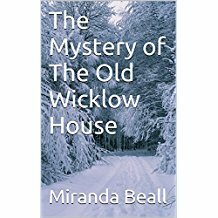 But ultimately she convinces Brad to turn once again to the Ouija Board to unravel the mystery of The Old Wicklow House.